This is a short story I wrote and this is the story behind the illustration Crack in my zine Emma. Emma walks pass the Natural History Museum one afternoon and hears joyful scream of kids and adults. It is from the ice rink in front of the beautiful Victorian museum, which they set up in every winter. Emma stops and observes the skaters. This exact ice rink is where one of her ex-­boyfriends took her once for a surprise date, but the memory no longer causes any emotional response in her. It was a long time ago. Ice rink is an epitome of life. Some people are good at skating and enjoy the glides. Some are excellent at it. They go forwards and backwards, dodging all the obstacles skilfully, and spin and jump in the air as they wish. The other people, on the other hand, are not so. They stumble and fall. Some of them stand up and keep trying, and the others give up and leave the rink. There are a few people sitting on the outer benches. They have their skate shoes on their feet but do not make a move, just gazing the other skaters on the rink enviously. They might be too tired or too scared to try. The difference between the real ice rink and life, however, is the dark deep cold water lurking under the layer of ice, which happy life skaters tend to forget the existence of. 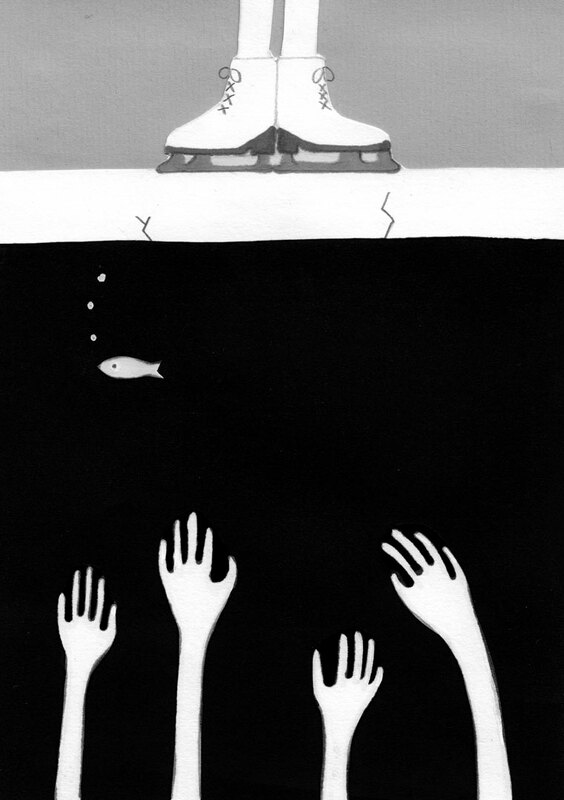 Unfortunate people fall into it through cracks of the ice and drown. Many people keep their head above the water by taking medication and going to therapies, or taking drugs and alcohol. Emma has fallen into the water a few times in 33 years of her life. Each time, she was saved by her supportive family and friends. At one occasion, she was saved by a cat that she impulsively adopted from a friend. She nearly drowned at the last incident. When she fell into the crack created by the man she really really loved, she did not know what to do. The dark cold water was so powerful and clung onto her body, and it was so hopelessly deep that she could not see the bottom. The icy water quickly filled up her lungs and penetrated her muscle. She could not breathe. However, Emma survived and the experience did not cripple her. She still skates. She has not yet fallen since because she now glides cautiously. She knows that she is standing on a fragile layer of ice and what lies beneath it. It is so thin that she could see through the dark water. She usually tries not to think about it and focuses on her glides. It leaves her mind on good days, but on bad days, she can feel the pull of the water. Emma sees a couple on the ice rink. They are skating hand in hand. The girl loses her balance and nearly falls, but the boy catches her just in time, and they laugh. Emma hears a little crack under her feet.